The Opener: When you arrive for Thanksgiving, kick things off with something light such as Sierra Nevada's Otra Vez Gose. The beer is both refreshing and tart, making it a great way to get those saliva glands up and running for the main event. If gose's aren't quite your thing, then a crisp pilsner or lager can be a wonderful way to start the holiday. Something like Firestone Walker's Pivo Pils can be just the right amount of hops to get the party started right. TURKEY TIME: When it comes time for turkey, nothing pairs quite as well with the bird of the hour like a brown ale. Rogue's Hazelnut Brown Nectar is fairly widely available, and provides the perfect amount of nutty goodness to bring out the flavor in your turkey. If hops are your thing, then Dogfish head's Indian Brown Ale can also be a wonderful complement to turkey. Even better, the hops can help cut through some fatty Thanksgiving sides like Mac and Cheese and gravy. If you're enjoying something a little spicy and herbal like stuffing, then a pale ale like Tired Hands' Hop Hands can work well. Bells Two Hearted is one of those IPAs that pretty much everyone who likes IPAs loves. You can find it all over the country and it will pair amazingly well with fatty sides like garlic mashed potatoes and green bean casserole. If you happen to be in a state with easy access to Cigar City, the Jai Alai can also be a wonderful IPA to go along with those flavorful sides. Political discussions getting out of control? Drake's Denogginizer is a double IPA that packs a 9.75% punch. The IPA will go great with most Thanksgiving sides, and can be the perfect thing to crack open when you get up for seconds. When it comes to sweets, there's nothing like a good stout to pair with those sweet potatoes or pie. Left Hand's Milk Stout is one of the best out there, and will go great with everything from pumpkin pie to chocolate cake. Don't have any room left for dessert? A coffee stout can be the perfect way to end your meal. Try something like Founders' Breakfast Stout for a bold flavor with just enough caffeine to keep you from passing out on the couch. Let’s face it, 2016 has been a pretty garbage year for most of us. That said, there’s one thing we can all be thankful for this holiday: beer. While Thanksgiving typically has a rep for being a holiday best paired with wine, beer can also be a great libation to drink along with your meal. 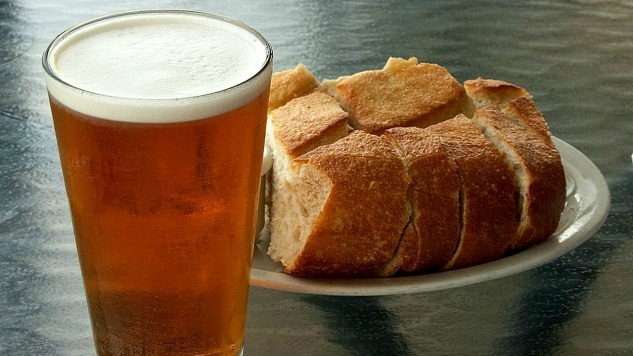 Just like wine, different styles of beer pair better with different courses in the meal. If you’re truly dedicated, you can transform your Thanksgiving meal into a beer dinner of sorts, with a different brew carefully selected for each dish. Not sure what to buy? We’ve come up with some suggestions that will have you covered from when you walk in the door at grandma’s until the last slice of pumpkin pie is served.